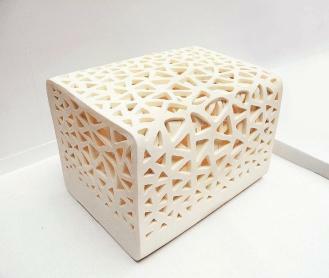 This unique chair resembles a block of tofu; as you can see, it is apparently a block of off-white material. Closer examination shows that the holes in the material have a particular pattern. Yu-Ying Wu, a graduate from the Department of Industrial Design at the Taiwan-based Tatung University, said that as she has problems with her knees, she wanted to design a chair that can buffer the pressure put on her knees when she sits down; and be sufficiently elastic to sustain her body when she stands up. The two sides of the tofu-shaped chair automatically transform into two arms when a person is sitting down, so the chair is as comfortable as a sofa. 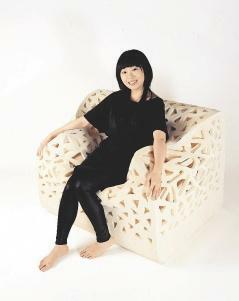 Wu added that her other inspiration for a chair with holes came from plant cells. The appearance of the holes makes people believe that the chair can breathe. Moreover, for the movement of either sitting down, being seated or standing up, the chair can transform in accordance with sitting posture, acting as if it were breathing. Zhde Patasz came in from the balcony... "Will you sit?" "As you command," Farr lowered himself upon one of the frail magenta bladders. The smooth skin stretched and fitted itself to his body.